The American Medical Equipment AME3500 and AME3584 system provides alternating pressure and is designed to be used in the prevention, treatment and management of Pressure Ulcers. Pump produces consistent air flow. 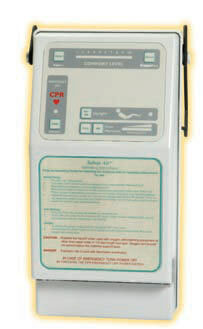 Special vibration isolating features insure that the patient rests easily, without feeling the pumps vibrating action. LED and audible alarm provide critical performance data and alert caregiver when pressure falls below 10mmHg (inner mattress pressure). Easy to replace individual bladders. Mattress has 20 air bladders, nine (9) with laser holes to achieve low air loss function, to increase patient comfort, keep the patient cool and speed recovery. Spring lined air tubes prevent kinks and disruption of air flow. 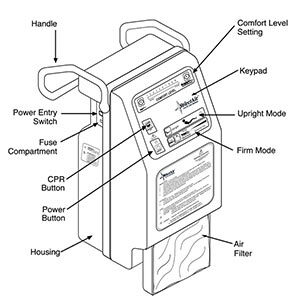 CPR valves provide fast (20-Second) deflation. Quiet, portable, lightweight and very reliable, the SelectAir mattress and control unit provide a cost-effective alternative to other pressure management systems. Firm Mattress Mode: Helps facilitate nursing care during dressing changes and patient repositioning. Upright Patient Mode:Adds support when the head of the bed is elevated. Foot Pillow: Helps to prevent unnecessary skin breakdown due to patient migration. Rapid inflation, easy set-up, and a motor so quiet, the patient will hardly Quick-Change Filter know it’s there! Keeps patient centered in the bed and reduces the risk of entrapment. Air escapes through tiny holes on the top of the mattress, and circulates under a vapor-permeable cover, to wick moisture away from patient. Foot pillow to address patient migration. Filter is easy to access, and quick to change for hassle-free maintenance. Low air loss and alternating pressure mattress system. Air cells are organized in three zones (heat, seat, foot) . Integrated side air bolsters to prevent entrapment and keeps patient centered. Alternating pressure provides three cycle settings continually readjusting the system. Auto firm to assist in transfers and repositioning. Fowler (upright patient) supports patient when head of the bed is elevated. Auto comfort mode simplifies setup and is based on patient’s weight distribution. Available with integrated raised perimeter with egress openings for fall prevention. 1. Place the control unit handle over the edge of the footboard. The handle will self adjust to the width of the footboard. 2. Insert the hose fitting with the clip into the air outlet of the control unit and turn 1/4 turn. Ensure the hose fitting is firmly seated and that the latch ‘clicks’ into place. 4. Ensure the power entry switch is “OFF”. 5. Firmly insert the power cord into the outlet on the control unit. 6. Insert the other end of the power cord into an equivalent grounded power receptacle. Mattress Note: Make sure that the mattress hose fitting is at the foot end of the bed frame. A. When using the Mattress Cover with Mattress Replacement: While the mattress is inflating, it may be helpful to partially unzip the cover and guide the mattress into the correct formation. 1. Always remove the existing mattress from the bed. 2. Before placing mattress inside mattress cover, ensure that all four side bolster straps (two per side) are securing side bolsters to mattress sections and Velcro® fasteners are mated. 3. Insert the mattress and mattress pad inside the mattress cover and zip the cover shut. Place on the bed frame. Be sure the hole in the mattress cover is in the correct position to fit around the hose fitting outlet on the mattress. 4. Strap the cover to the bed frame using the four straps located on each side of the mattress cover. Mattress Configurations Individual baffles divided into 3 sections; head, seat and foot. Integrated side air bolsters with foot pillow. Mattress Sizes Available Fits most standard bed frames. Custom sizes available. Topper Material: zippered all around and quilted urethane coated nylon fabric (2-way stretch) water resistant, vapor permeable, machine washable and low sheer. Base Material: zippered PVC mesh. 4-Air cells at head section remain static to enhance pillow function. Dimensions: 36" (W) x 80" (L) x 8" (H).